Whitegates tearoom in Northallerton is a wonderful place to enjoy a nice, hot meal with your friends or family. Our tearoom will bring back memories of carefree mornings and beautiful summer afternoons from your childhood days. It is a part of our British tradition that has been missing from the lives of many, a tradition of enjoying nature with a fresh cup of tea and tasty scones. Yum Yum! 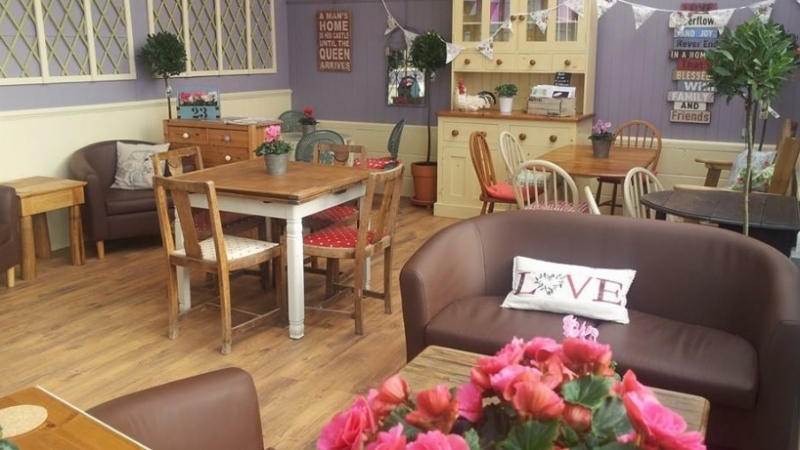 Whitegates garden centre tearoom in Northallerton is very popular with both families and individuals looking to spend quality time with their loved ones. Our tearoom has a pleasant, relaxed atmosphere where people can start their day with a hearty breakfast before starting a tour of the garden. You can also take a break from sightseeing during the day and visit the tearoom for tasty and hot meals or a quick snack whenever you want. What makes Whitegates tearoom special? Whitegates nursery tearoom near Northallerton is warm and welcoming. We make fresh brews of tea throughout the day for the visitors. Our skilled chefs and bakers prepare fresh food for the customers using the best quality of ingredients. We take great pride in serving the most delicious and mouth-watering meals, cakes and pastries during serving hours. The meals that set our tearoom apart and make our nursery popular with our customers include the following. Sandwiches prepared in order to ensure freshness. Hot tea and coffee served all day long. Our chef’s speciality English breakfast in the morning will put you in the mood for sightseeing. It is a perfect mix in our garden centre. Hot lunches are served afternoon and we offer a variety of meals to choose for the whole family. Delicious cakes, gateaux and pastries are baked daily. We aim to give our patrons the best taste. A variety of light meals and snacks are served throughout the day. Have your pick of jacket potatoes with a variety of fillings, a slice of lasagne or pies. Amazing quality of ice-cream prepared in our own kitchen. Very popular with children. Click here for some photos and an impression of our tearoom. Our tearoom is the perfect stop while shopping for plants, seeds and gardening supplies. Whitegates nursery is spread over a large area and there are hundreds of varieties of plants, flowers, fruits, vegetables and seeds to choose from. Touring the garden centre is an amazing way to spend your day but it can leave people slightly tired, especially children. For an overview of what we sell, visit our product range page. The tearoom is open throughout the day during the opening hours of our garden centre. You will find our staff incredibly friendly, helpful and the quality of food is unparalleled. If you visit the Whitegates nursery be sure to check out our tearoom to grab lunch or snacks. You will not be disappointed!